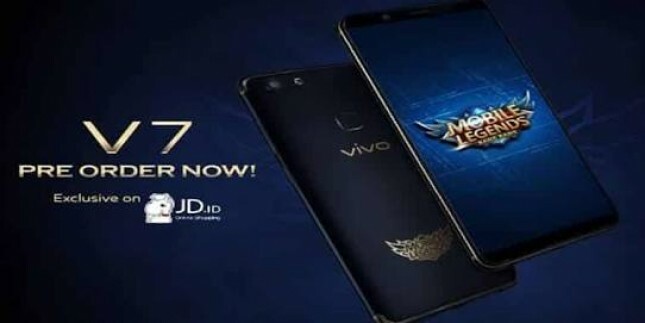 INDUSTRY.co.id - Jakarta - Vivo launched a variant of the special edition V7 Mobile Legends: Bang Bang at the end of 2017. "The Vivo limited-sold smartphone supports user activity without affecting the visual quality of the content," said Irfan Alvianto, Vivo Indonesia Product Manager. In terms of appearance, this special edition is slightly different because the rear body of the Black Matte colored device with nano sand coating equipped with Mobile Legends located at the bottom. Vivo gave a gold accent on the frame and the side of the smartphone 5.7-inch sail. This Chinese smartphone manufacturer also promises Customized Optimization options in Game Mode feature will reduce the lag when playing Mobile Legends: Bang Bang because it is able to maintain the stability of internet connection. When activating the feature, the player will not be disturbed notifications or phone calls and can reply to chat without having to stop the game. Just like its original variant, Vivo V7 Mobile Legends edition: Bang Bang is chased by Qualcomm Snapdragon 450 chipset with a 1.8GHz Cortex-A53 octa-core processor combined with Adreno 506 GPU and 4GB RAM for maximum smartphone performance without lag. In addition, Funtouch OS 3.2 based on Android 7.1.2 Nougat supports more multitasking activities, including while playing. Internal memory of 32GB which can be upgraded to 256GB with the presence of microSD slot also makes the user has more space for various applications. Vivo V7 Mobile Legends edition: Bang Bang is offered at Rp3.799.000, just like its regular edition.